Ranking near the top of the naturalist’s what-the-heck-is-that list is a very strange creature called a butternut wooly worm. 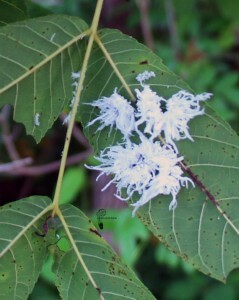 A more applicable name would be the coconut flake worm as it looks like a strange type of sugary confection with delicate, snow-white tendrils that move in the lightest breeze. This little oddity feeds on walnut, hickory and butternut leaves and is the larvae of a sawfly (Eriocampa juglandis). Sawflies are related to bees and wasps but don’t sting. They have outbreak years when more defoliation occurs but they do not tend to pose a significant health risk to their host species. Walnut trees could be planted in a highly visible area solely for the opportunity to spot these delightfully peculiar grubs. However, walnut tree placement takes a bit of planning in the landscape as the nuts with their husks can reach 4” in diameter. For this reason, they are probably not the best choice around parking areas as a vehicle could sustain a substantial dent should the nuts hit with sufficient force. Too, the walnut husk contains a dye that stains almost anything it comes into contact with – like cement sidewalks and asphalt. Walnuts have not typically been a first choice in landscape design but they have an interesting strength of form, particularly in the winter months. 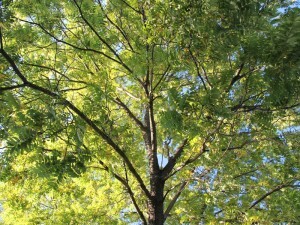 Given sufficient room to grow, they are very beautiful trees in each season. In the fall, the foliage turns a bright yellow, creating a pleasant splash of color, particularly when growing en masse. Ecologically, in addition to the butternut woolly worm, they support more than 100 species of Lepidoptera. The walnut is known for its allelleopathy. 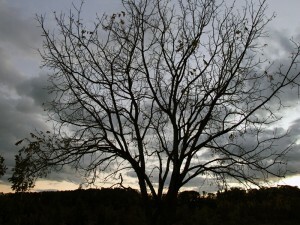 The roots contain juglone, an allelochemical which retards growth of competing plants under the canopy. 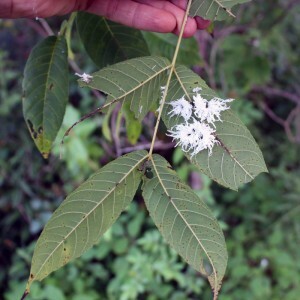 However, it is the non-native plants which are most affected by this natural defense mechanism as they share no evolutionary history with the tree – other native shrubs and understory species grow fine in proximity to walnut trees. They can reach a height and width of 50-75 feet (though some older trees can be even larger in the right growing conditions, towering up to 100 feet). They do best in full sun with rich soil. 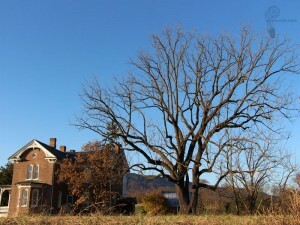 The current champion on the Virginia Big Tree Registry lives in Westmoreland County and tops out at 104 feet and a canopy spread of 55 feet. 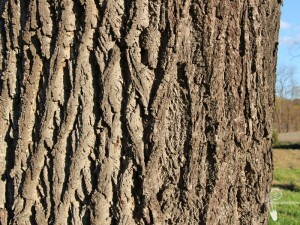 The wood of the black walnut is prized for its dark, rich luster and is used for the finest of woodworking projects and veneers. The nuts are prized by humans and animals alike for their taste and health benefits. Native American tribes in the black walnut’s home territory (PA to GA and stretching as far west as Texas) made use of this versatile tree by using the dye from the husks to color baskets and used the oil to cook corn and beans. In conclusion, the black walnut is an under-utilized native tree in the landscape but one which has tremendous ecological value and can provide beauty in a variety of settings.